The Chest Box can be used both in your truck and for household storage. This makes transferring items simple. You can just move the entire box from the truck. The Single-Lid Crossover is by far the most popular truck tool box on the market, as well as the most versatile. 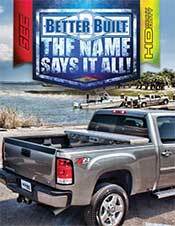 Better Built pioneered the Crossover style truck toolbox, setting an industry standard that all manufacturers follow today.